Journaling for Chronic Pain: How Does Journaling Help Pain Management? If you are living with chronic pain, it would behoove you to start journaling. What is journaling? 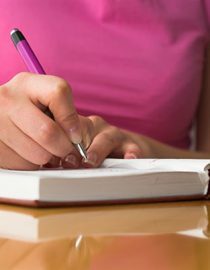 It isn’t like the journaling you may have done for high school English class, but it serves a useful purpose for anyone who lives with chronic pain or any other health condition. Journaling does not need to be done in a formal format, but should be organized enough for anyone reading it to make sense of its contents. Your chronic pain journal should be useful for you in two ways: 1) it should help you and your doctor identify triggers to your pain; and 2) it should reduce your stress levels where your pain lessens as well. Activity during the day: Note the type of activity, duration, and intensity. Foods and fluids consumed: Anything that goes into your body should be documented. Pain: Time/date, location, duration, description (stabbing, aching, etc. ), and what helped/didn’t help to alleviate it. Rate the Pain: Using a scale of 1-10, with 10 being the worse pain possible, is an easy and effective way to rate chronic pain. Other symptoms: Sometimes other symptoms may be related to the pain experienced. Does the pain interrupt anything like sleeping or working? Non-drug therapy used: yoga, meditation, or other interventions; were they effective in reducing pain? Were there any emotions connected to the pain? The doctor can make adjustments to the pain medication based on the journal findings. Pain patterns can be identified, so medication can be prescribed at times of need. Some types of weather can aggravate pain; chronic pain on certain days may indicate this. Pain control may need to be adjusted on those days. You may not know what your pain triggers are if you don’t keep a journal. It will give you a sense of control over your health condition and pain management. Not only that, it makes for improved communication between you and your healthcare provider. Working together can increase your chances of getting the proper treatment for your chronic pain. Journaling doesn’t need to be a health record only; you can write about your struggles, feelings, and other things weighing on you. It can be helpful in a way that you can reflect on your writings and “get to know” yourself in a different way. There are no steadfast rules to journaling. You can pen poems or write an unsent letter to someone who causes negativity in your life. Getting it all on paper can be stress-relieving; this will help lessen your pain sensitivity. Try journaling and see for yourself the benefits you can derive from it. Often, epidural injections provide enough relief from severe pain to let a patient progress through a rehabilitative stretching and exercise program.